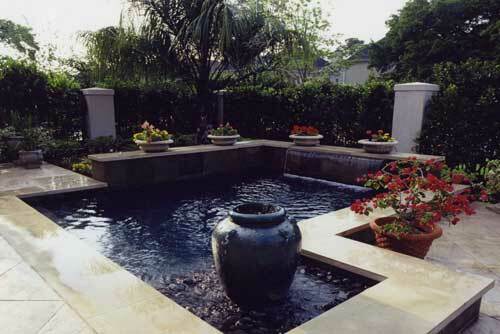 Raised walls and multiple deck levels add dimension and style to this small courtyard pool featuring a casual urn fountain on a pebble rock ledge. the dining terrace is flush with the house interior and flows down oversized steps to the lower sun terrace creating a raised seatwall affect from below. Wide limestone coping and colored concrete decking provides an elegant, spacious feel contrasting with the dark blue plaster, slate facing and tropical planting.